New Niki Biki Camisole Colors Are Here! That’s right……You wanted the latest extra long Niki Biki Tank Tops and we have them! 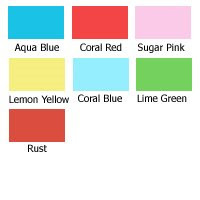 The latest colors added are: Aqua Blue, Coral Red, Sugar Pink, Lemon Yellow, Coral Blue, Lime Green & Rust. What don’t you have yet? We are glad we can offer these fun and vibrant colored Niki Biki Tank Tops to you! Keep posted as we will add more soon. Become a “Repeat” customer if you haven’t already!